The stories, images and poems in this issue of the Respite Reporter explore many facets of caregiving and highlight promising practices for quality dementia programming. The caregivers you will meet connect with others through the arts. Through storytelling, poetry and photography these family members share the deep and lasting bonds they have with their respective parents. These forms of self-expression carry gentle reminders to listen deeply, “stop and smell the roses,” and honor human dignity. Such creative endeavors can be seen as excellent examples of self care. 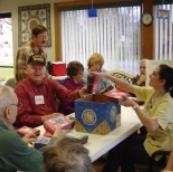 Group Respite and Early Memory Loss programs also offer the opportunity for care partners to take care of themselves. These programs, designed for people with dementia, provide meaningful, stimulating and engaging activities. You will read that adaptive technologies and memory enhancement techniques can improve the quality of life and cognitive functioning of many members who attend these specialized programs. Evidence now exists to support the value and benefit of these approaches. The common thread is the compassion we bring to our loved ones, our clients and ourselves as we experience dementia’s challenging and often life-affirming journey. 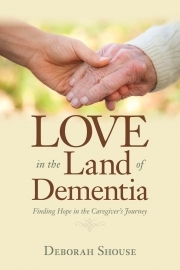 Award winning author Deborah Shouse offers us a rare opportunity to preview a story from her upcoming second edition of the book Love in the Land of Dementia, Finding Hope in the Caregiver’s Journey. The chapter, titled “Connecting and Healing Through Sharing Stories: My Caregiver’s Journey,” can be summarized by saying that “At every encounter with caregivers,” Deborah learns more about the “incredible power of love.” Read the featured excerpt. 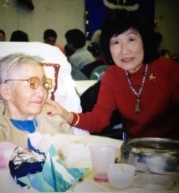 Poet, caregiver, author and teacher Frances Kakugawa inspires, instructs and encourages other caregivers to find the poet within. She tells us that writing is a way of “transcending the burden of care with love, understanding and kindness.” Read more about Frances’ insights on caregiving, Alzheimer’s Disease and the power of writing. John Basgall, who lives in San Francisco, CA, regularly travels by bus, train or car to the Sierra foothills to care for his mother. 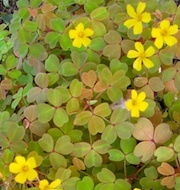 The richly colored photos in this newsletter display the beauty captured by John’s artistic eye and skill with his camera. These life affirming images offer us a glimpse into John’s day-to-day sightings: in his beloved city, as a passenger and in his mother’s garden. Read more . . . The good news is that specialized programs for people with early memory loss are more readily available now in many regions of the United States with care partners and participants alike providing feedback about their many benefits. Researchers have also begun to gather data to augment this qualitative and anecdotal information. Read more about these educational, enriching and supportive programs. People living with dementia can now enjoy a variety of technological tools, games and therapies that are designed to draw upon individual strengths and abilities. This article takes a look at some of the creative ways that technology can positively engage people and boost a sense of well being. Read about technology as a non-pharmacological intervention. 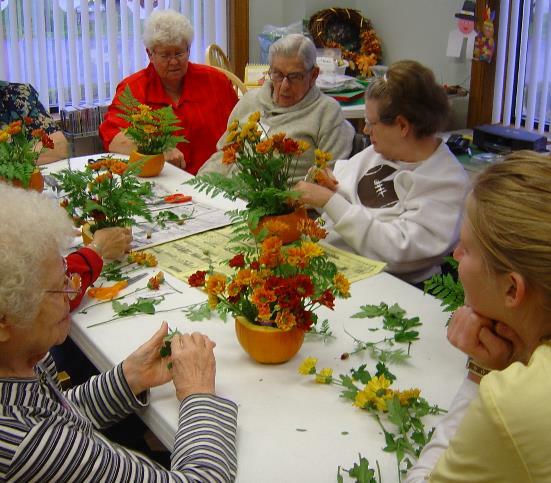 Group activity photos on this page: Members of the Pines Senior Respite Services, in Coldwater, Michigan are 1) enjoying a flower arranging activity and 2) making and sending greeting cards to servicemen.